+$Take a peek inside issue 165 of ImagineFX magazine – out now! 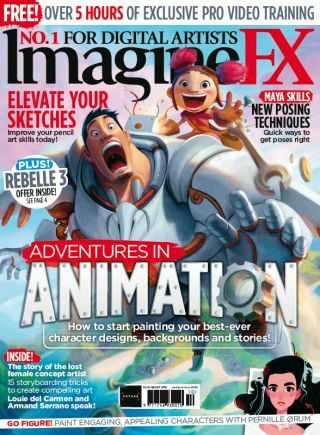 +$Learn how to start your animation career and discover how to develop your characters and stories with the latest issue of ImagineFX magazine – on sale today. In the pages of ImagineFX 165, you'll hear advice and inspiration from teachers in the industry who want to help you take your first steps into the world of animation. +$Elsewhere in issue 165, we talk to Louie del Carmen about how he developed a love for animation and landed work with Disney. We also hear from Bader Badruddin on how to start developing character animation faster and stop over-analysing, plus David Ardinaryas Lojaya is on hand to tell you how to use greyscale to render figures. There's also all the news, reviews and reader art you've come to expect – don't miss it! +$Conventions have exploded over recent years. And thanks to communities developed online, finding the right one for you is easier than ever. We talk to organisers and attendees about how artists can get the most out of conventions, whether they're there for business or pleasure. +$He might be a successful Disney animator now, but for Armand Serrano the road to glory was not without a few speed bumps. Having been knocked back by both Warner Bros and DreamWorks, the persistent artist finally found a home in the famous animation studio, and as he says, "the rest is history." Discover his story in this exclusive interview. +$There's a lot of received wisdom when it comes to nailing a distinctive character design, but how do you juggle all of these rules and find room to develop your own style? Luckily, Pernille Ørum is on hand to reveal her approach, covering everything from colour, pose and silhouette. +$Sometimes just getting started can be one of the biggest creative hurdles for artists. With that in mind, Tim Von Ruden is here to remind you that the best way to level up your work is to stick at it. And with the help of his sketching advice, you'll be creating better work than before in no time.